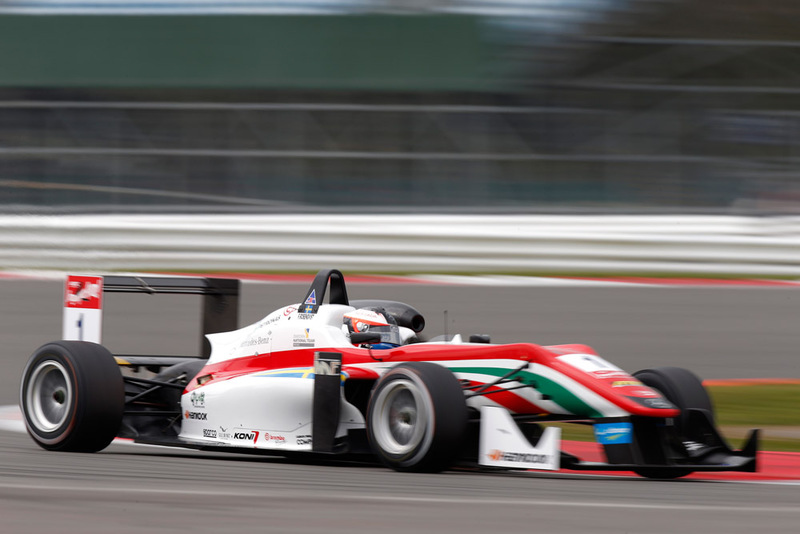 Rosenqvist wins Race 1 at Silverstone. © FIA F3 Media Services. Felix Rosenqvist claimed the opening FIA European F3 win of the season at Silverstone, during a race peppered by safety car interruptions. The Swede – now in his fifth year at this level – led from the start and despite the constant presence in his mirrors of Carlin rival Antonio Giovinazzi, Rosenqvist could not be pressured into an error. The racing would last only a few short moments, George Russell and Charles Leclerc clipped on the approach of Vale, which in turn caused Brandon Maïsano to spin, while just behind Matt Rao and Kang Li had offs. While there maybe a touch of truth in Rosenqvist’s statement, it would be amiss to mention that almost all who ran off road at that time were effectively Formula 3 rookies. From the lap six restart, Rosenqvist headed Giovinazzi again and had built a 2.4s lead over the Italian when the race was neutralised after another off, this time for Alessio Lorandi, who had beached his van Amersfoort Volkswagen into the gravel at Woodcote. Once again Rosenqvist led from Giovinazzi at the restart, but this time the Carlin man stayed closer to the lead, with Rosenqvist not stretching the gap to more than 1.0s. Jake Dennis completed the podium in his Racing Steps Foundation-backed Prema Powerteam Mercedes. Dennis enjoyed a brief battle in the early green flag running with Signature’s Alexander Albon, only for Dennis to settle the battle in his favour with a solid pair of post-safety car restarts. Albon took 4th and was the highest placed rookie. He managed the gap back to Markus Pommer, while Lance Stroll rounded out the top six. Gustavo Menezes made a solid start to assume 7th, although one of the more startling performances came courtesy of Russell, who 18th after his clash with Leclerc. From there, Russell rose through the order taking 8th at the flag after he passed Maximilian Günther, Callum Ilot, Pietro Fittopaldi, Mikkel Jensen and Nicolas Beer in the final two laps alone. Günther (9th) and Ilot (10th) rounded out the points scores, while the quick Leclerc could only rise to 12th come the end.